Amidst all the new coffee technologies and trends out there, sometimes it’s nice to have a simple, traditional cup of coffee. Our co-founder JP has achieved a zen-like balance between embracing innovation in the coffee industry and staying true to his old-school sensibilities. One of the traditions he brought from his hometown of Nice, France, was his mother’s French press recipe – a relaxed, homestyle way of making coffee that has, in recent decades, been replaced by strict ratios and precise brewing techniques. For this recipe, you can put away your scale and get back in touch with your coffee intuition. For this recipe, you’ll need a French press and your favorite coffee ground fairly coarse. Our classic Nizza blend would make a great, sweet brew in this. Fill your French press up about 1/6 of the way with coarsely ground coffee. We’re taking it easy for this recipe – it’s cool to eyeball it. Boil filtered water, then let it cool off for about 30 seconds. Cover the grounds in about an inch of water and let them bloom for 30 seconds. Fill the French press with the rest of the water, pouring slowly and evenly. Before putting the French press lid on, use a long spoon to gently stir the grounds once or twice. This helps suspend the grounds throughout the water, creating a “slurry” that extracts more evenly. With Nizza, aim for a total brew time of 2 minutes and 45 seconds. Lighter roasts will need to be extracted longer – closer to 4 min. Don’t get distracted and let the brew sit too long or it will start to taste bitter. 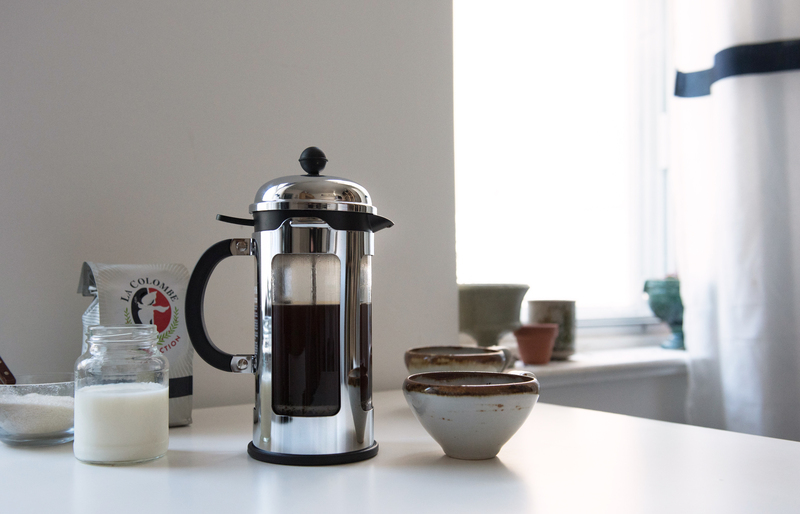 Press the plunger down on the French press, and pour all of the coffee out – not just what you’re going to drink. If you let the extra brewed coffee sit in the French press, it will continue to extract and its taste will worsen, so pour it into another vessel until you’re ready to drink it. As any modern coffee nerd will tell you, this is a classic, rustic way of brewing coffee. It might take years of playing around with the recipe to get it tasting how you like it. This recipe was adapted from Popular Mechanics magazine, but you can learn more via our online brew guides. We are having couple time working with our French Press. Feeling not completely zen at all, but short of coffee wars. Discussion is about density of the coffee and how that affects measures of grams, cups. Thanks for any info. Nice to see that my years long habit of brewing Nizza in a French Press is getting some love. One comment, before pressing down, pull up a quarter to a half inch, and let sit for 30 seconds. The water logged grounds naturally sink to the bottom on their own. The down push should require very little pressure. I was a Corsica lover for years and just a few months ago fell in love with Nizza brewed in my French Press. In touch with my coffee intuition! Who knew? Thank you!